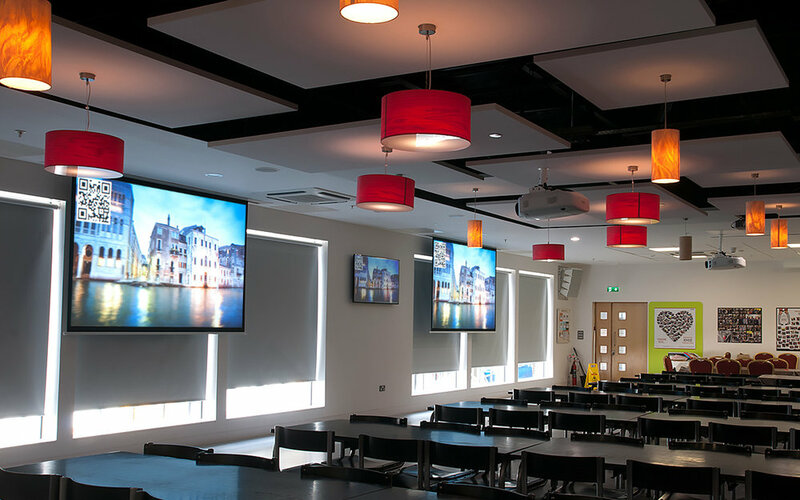 We were delighted to have another opportunity to partner with leading AV integrator, Meritec, on this project for Stryker's staff cafeteria at its Limerick facility. Stryker wanted retractible screens with a neat, unobtrusive design that would to stand up to scrutiny sitting alongside high-quality monitors. The bright ambient lighting and with ultra-wide viewing angles in the cafeteria, meant there was only one screen up to the job - the dnp Supernova Flex Classic. The installation saw 2 dnp Supernova Flex Classic screens housed in bespoke ceiling-mounted units with no visible mechanism, so they simply drop from the ceiling, giving a great end result and exceptional user experience and was chosen as dnp denmark's Installation of the Month for August.